Today we’re going to get a bit old school and do a ‘What’s in my bag’ post. Which I did back in like 2016 so thought an updated one was due. Is it just me who is still super nosey and still loves posts like these? I just think they’re a fun read. So yeah, lets dive right into my bag, shall we? I’m so bad at buying new bags, so all of mine are really old and tatty. I also mix and match between bags every day. So I’m not going to bother with the ‘this is my bag’ portion. 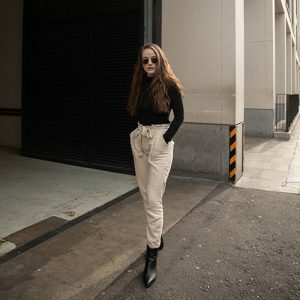 I only ever use my cross body bag for popping to the shops, coffee dates or nights out. Or my handbag/backpack for bigger days out or shoots. So this will just be a general essentials post. But let me kn0w if you’d like to see what I take to go shoot or something like that! Anyway, let’s go. We’ll get these out of the way. The essentials everyone has: wallet (mine is from New Look if anyone was wondering and was only £3 – bargain. ), keys, gum, glasses, deodorant, tissues. The usual. Of courseee my phone is with me at all times. It has everything on it and saves a lot of hassle. And of course you’ve got to keep your phone protected, especially when you’re me and are all too clumsy. So I’ve got to keep a case on it at all times. My case is from CaseApp, who kindly sent me 2 of their cases. 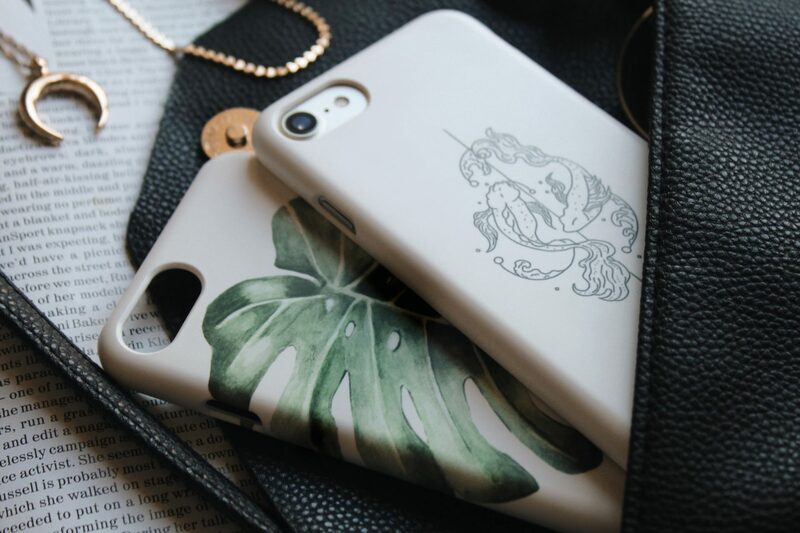 They have such an amazing range of phone case designs to choose from, such as the Monstera case I got and you can also get personalised phone cases and/or laptop skins which is super cool. I decided to get a personalised iphone case as well with this fish design I found on Pinterest. And I was pleasantly surprised with how the picture came out on the case, as I was scared the size may effect the picture but it looks so sleek! 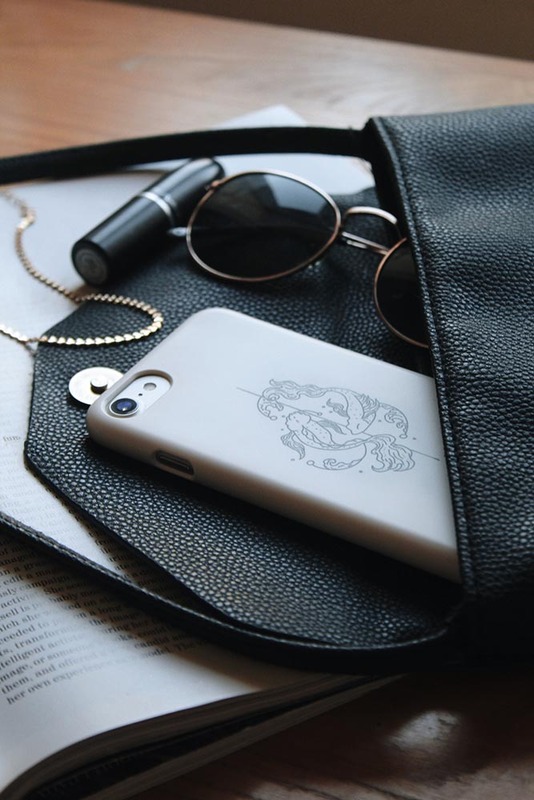 Also the quality of their cases are amazing to keep them well protected. Definitely check them out, also use my code EMILYBECCA20 for some dollar off your purchase! Gonna bang this in one section. My phone has it’s little entourage that goes alongside it in my bag – my earphones, portable charger and phone lead. I can’t trust my phone to stay alive so I keep a small charger and my lead in my bag just in case. And of course I take my earphones with me wherever I go, I’m just very antisocial and it’s always better walking or taking public transport with some tunes to keep you occupied. Putting toiletries bag didn’t sound as fun so it’s now my ‘gal bag’ apparently. But I think most girls have a bag like this or this collection of items in their bags. I tend to just take any essential toiletries or cosmetics with me in case I need to freshen up. I always take basic makeup products such as brow gel, concealer, lipstick, powder and bronzer just in case I’ve been in a crowded train and my makeups just melted off my face (has happened all too many times). And then lip balm, I literally have a lip balm stashed in every bag and coat pocket just in case; perfume or body spray, hand cream, hand sanitizer and of course tampons. Can never be too sure. I’ll also pop paracetamol and plaster in there just in case as I’m an over prepared mother when it comes to these things. A bag…inside a bag?? You’re probably wondering. But yes, if I know I’m going shopping I tend to take a small tote bag with me as they fold up small and don’t take up room. But are so much better for putting shopping in as they’re sturdier, and they’re good for the environment! Got to reduce the plastic people. So that’s a little what’s in my bag! I kind of feel like I’ve fallen back into 2013 and I’m not complaining. Anyway, have a lovely rest of the week pals! P.s there will be a giveaway going up on my Instagram soon so definitely go watch out for that! 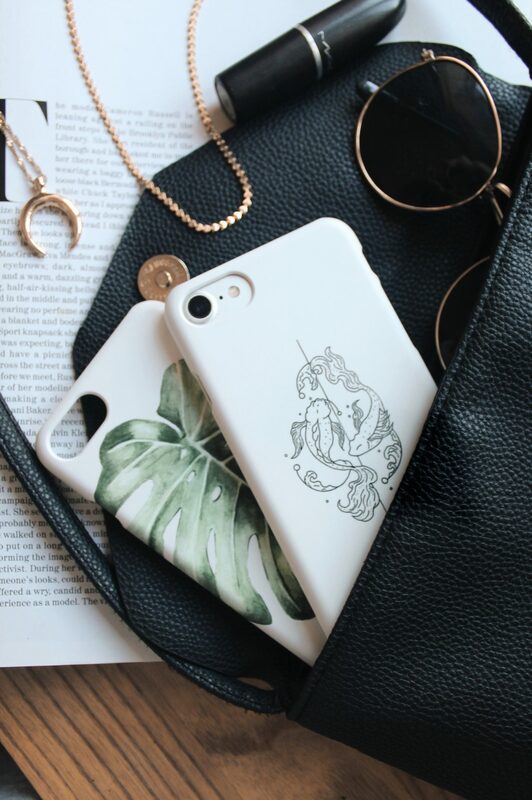 That monstera case is EVERYTHING! Love love love it. I love whats in my bag posts, always love a good nosy haha! Caseapp cases are gorgeous aren’t they, I have so many! Haha I love the term gal bag!! That’s definitely one I’m gonna start using now. These cases look gorgeous, I just might need to check them out as I’ve got a boring, bulky otterbox atm! I love what’s in my bag posts, I’m so nosey!! ooh i loved this post, i always have so much in my bag it’s a joke lmao! Oh I love having a nosy in peoples bags! These are probably my favourite type of post haha.